In front of packed house at Mitchell Stadium and thousands of viewers streaming the game at home, the Bluefield Beavers picked up right where they left off last season. The 2017 AA state champions used a huge first half to put the annual cross-town rivalry game against the Graham G-Men out of reach. The Beavers won the first ever Coalfield Sports’ Game of the Week by a score of 38-14. 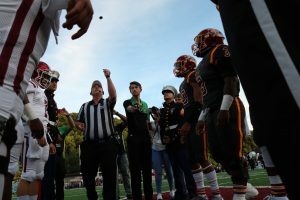 You could feel the electricity in the air as the captains met at midfield for the coin toss, presented by the Great American Rivalry Series & the United States Marines. The “visiting” Beavers won the toss and elected to defer to the second half. The G-Men started the game on their own 20 after Bluefield kicker Kaulin Parris booted the opening kickoff through the endzone for a touchback. However, the G-Men couldn’t gain any traction as the swarming Beaver defense forced a 3 & out. Things worsened for the G-Men on fourth down as Bluefield’s JJ Davis blocked a Joey Dales’ punt to set up the Beavers with good field position. A 28-yard run by senior tailback Ja’Mere “Juice” Edwards and a 15-yard run by Davis set up a four-yard plunge by senior fullback Arnold Martin for the first touchdown. Parris’ extra point made the advantage 7-0 for the team from Mercer County. After a second touchback, the G-Men started to gain momentum with a 13-yard pass from senior quarterback Cameron Allen to junior wide receiver Devin Lester. Allen scrambled for another first down, before the G-Men hopes were eventually stopped on a third down sack by Bluefield’s Deiyantei Powell. Joey Dales’ punt fared better this time with the G-Men downing the ball at the Beavers’ own 5 yard line. 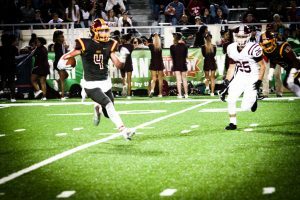 After advancing to the 23, senior quarterback Chandler Cooper found sophomore receiver Isaiah Johnson running wide open for a 77-yard touchdown pass. Parris’ kick made the score 14-0 with 3:19 remaining in the first quarter. Following Parris’ third touchback of the game, the G-Men struggled to find their groove on offense once again. Runs by Jaziere Reed and Allen weren’t enough to gain a first down on the first two plays. Bluefield linebacker Drake Mullins forced a punt when he sacked Allen on a third down drop back. The Beavers’ picked up where they left off the two drives before with Martin and Edwards marching them down the field, leading up to JJ Davis’ 42-yard touchdown run. Parris made another extra point, bringing the Beavers’ lead to 21-0 over the Virginia-siders. Following another Graham punt, the Beavers took over with good field position, looking for their fourth score in four tries. 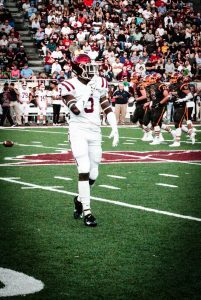 Cooper helped that cause when he connected with senior receiver Ronnel Blevins for a 46-yard pitch-and-catch. A 10-yard run by Martin set up Juice Edwards for his first touchdown of the game from 4 yards out. Parris’ kicked his fourth booming extra point of the night. 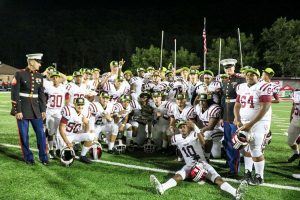 On the next possession, trailing their rivals 28-0, the G-Men were finally able to gain momentum with a 68-yard quarterback scramble for a touchdown by Allen. Dales’ point after try was good, bringing the G-Men back within 21 points at 28-7 with 6:30 left in the second quarter. That momentum was short lived. On the next possession, the G-Men defense was able to get their first third down stop of the night. Not before Cooper connected on a 44-yard heave junior to wide receiver Jahim House that put the Beavers in field goal position. Parris’ 42-yard field goal was right down the middle, bringing the score to 31-7 and taking the game to halftime. The Beavers opened the second half on offense but were forced to bring Parris out for his first punt of the night. 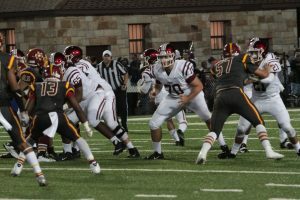 The Graham offense took over with a full head of steam, with Allen connecting with Lester for throws of 11, 39 and 13 yards. With Allen coming off the field with cramps, Lester took over the quarterback duties and finished off the drive with a 12-yard touchdown pass to senior receiver Chris Shinault. Dales’ point-after made the score 31-14. With the momentum swinging to their side, the G-Men were able to force another punt on defense. Allen came back on the field with 3:40 left in the third quarter and immediately found Lester for another reception. The wind was back in the sails for the G-Men, however, two plays later Juice Edwards intercepted Allen’s pass intended for Isaiah Justice. Chandler Cooper brought his offense back on the field, with the game never again in doubt. The Beavers were able to tack on a fourth quarter touchdown by Edwards, which was set up by JJ Davis’ second punt block of the game. Parris’ perfect kicking night continued as he finished out the scoring, making the score 38-14. Both teams will take on county rivals in week two. The Beavers will host Princeton at Mitchell Stadium, while the G-Men will travel to Tazewell to take on the Bulldogs. Defensive Sean Martin: 8 tackles, 3 sacks. I was raised in beautiful Abb’s Valley, Virginia.